This post is a little dated. The trip began almost two weeks ago, but we did not settle on a “blog” name until tonight. I guess we are “bloggers” now. Enjoy. The first few posts are a condensed version of the trip so far, from Anchorage, Alaska to Granite Bay, California. No photos today. We started our trip from the driveway of our old house in Spenard after Chandler’s last day of work on October 1, 2012. After the obligatory 3 stops before leaving town, we drove north to head south, ending up somewhere outside of Tok around midnight. We spent the first night camped out in the back of the truck in a pullout. The temperature dipped into the high teens, and in the morning, the inside of the truck topper was covered in ice. To Canada! Our drive south was pretty direct, motivated by the sub freezing night time temperatures in the back of the truck and the near freezing daytime temps on the road. We stopped periodically for quick breaks mainly for Lucy the Dog. The truck and trailer handled the hills admirably, only occasionally complaining in second gear near the tops of a few mile long 8-10% grade hills. Dinner tonight was at the slightly puzzling Canadian phenomenon of “Boston Pizza” which seemed to be nearly as ubiquitous as McDonalds in the cities of western canada. I guess they are around in the states as well, but I don’t recall them being as visible. We caught up on our baseball news including learning of the unsurprising rolling-over of the sox to the yankees in a final wimper to punctuate a memorable season. 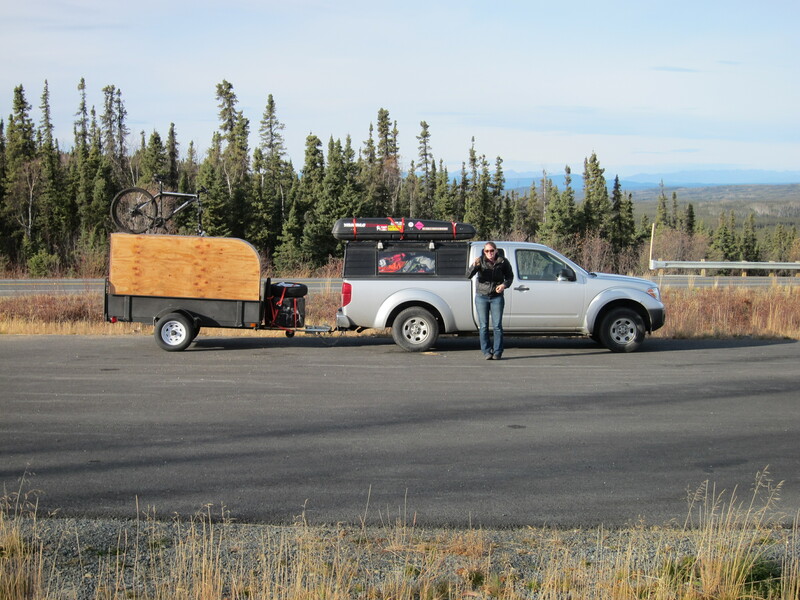 We spent the night at a rest stop near a bridge just south of Whitehorse.